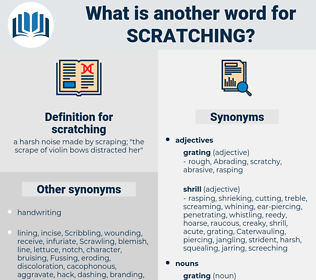 What is another word for scratching? a harsh noise made by scraping; " the scrape of violin bows distracted her"
F. B. Hastily scratching off these words Harris enclosed, sealed, and addressed the message, and tossed it on the table. After it had wandered some time, it crawled up the bank, and enjoyed the luxury of scratching itself, and rolling about.